Purchasing used forklift trucks requires an acute attention to the details. Unlike a new forklift, a used lift truck comes with a history that you will likely not know. More, its current state or repair is another factor that you must research. Far too many equipment retailers consider a few cans of spray paint all the expense they are willing to invest before selling it to you. The rewards for a good purchase decision is a dependable unit that operates with as little downtime as possible. Here are eight points to start you off on your search. So you’re thinking about buying a used forklift? Purchasing used could be a great decision, or it could be your worst nightmare. How often are you going to be using the forklift? If you’re going to be using your forklift every day for multiple hours, you may want to consider purchasing new instead of used. Purchasing used can save you a lot of money up front, but it can end up costing you in the end. How quickly do you need it? Purchasing used can save you a bit of delivery time, so if you’re in need of a quick delivery, used might be the way to go. Have you had a mechanic do an inspection? Just like purchasing a used car, you always want to have a mechanic inspect a used forklift before you purchase. Can you purchase from a reputable dealer? If you’re purchasing from a reputable dealer, you’re probably getting a forklift that will last awhile and run well. However, if you can’t purchase from a reputable dealer, know that you’re taking a risk. Have you checked the safety elements? It’s not just the transmission and mast that should be inspected. Make sure you’ve inspected the seatbelt, horn and the lights as well. What are the tires like? One great way to tell what the condition of the forklift is like, is to look at the tires. Since forklifts don’t have suspension or shocks, bad tires usually say the forklift has been used on rough pavement, which is a sign you’ll probably have issues down the road. What kind of warranty can you get? If you’re purchasing a forklift from reputable dealer, the dealer should be able to give you a warranty. If he knows the forklift is in bad shape, he won’t. Have you test driven? If you’ve considered all seven things prior to this one and they check out okay, do a test drive to confirm. You may think you really like the forklift and then decide it isn’t for you. You and your employees may be using the forklift often, so you want it to be comfortable. 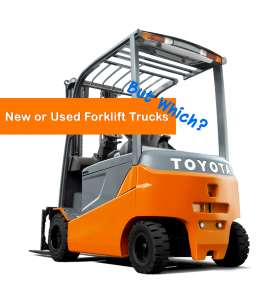 Used Forklift, Asset or Liability? We would enjoy hearing from you. Post your ideas or comments below, let’s start a dialog. For more information, insights or conversations regarding your forklift or material handling needs. You can visit our online contact form, call me at 763-315-9288 or email kthill@toyotaequipment.com. We would welcome the opportunity to cover your material handling questions or concerns. Toyota Lift of Minnesota works very hard to be your partner, and material handling consultant. You can also use our contact form below! Questions, Needs or A Concern? Contact Me Direct. Located outside of Minnesota or Wisconsin? Find help though your local dealer.